Reconstructed (by Wisedell as architect?) Parade House. 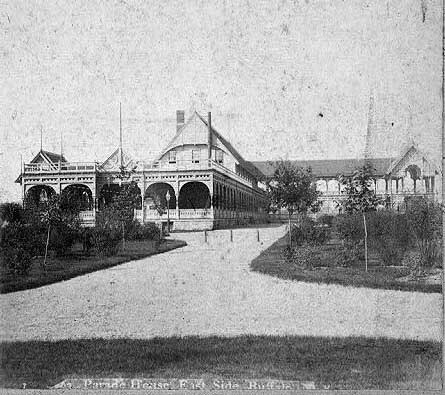 The smaller Robert Wallace-designed park shelter replaced the reconstructed Parade House soon after its demolition in 1904. 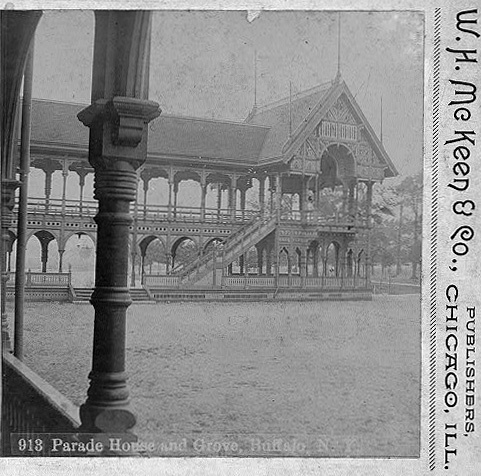 The smaller (and still standing) Robert Wallace designed park shelter replaced the reconstructed Parade House soon after its demolition in 1904. 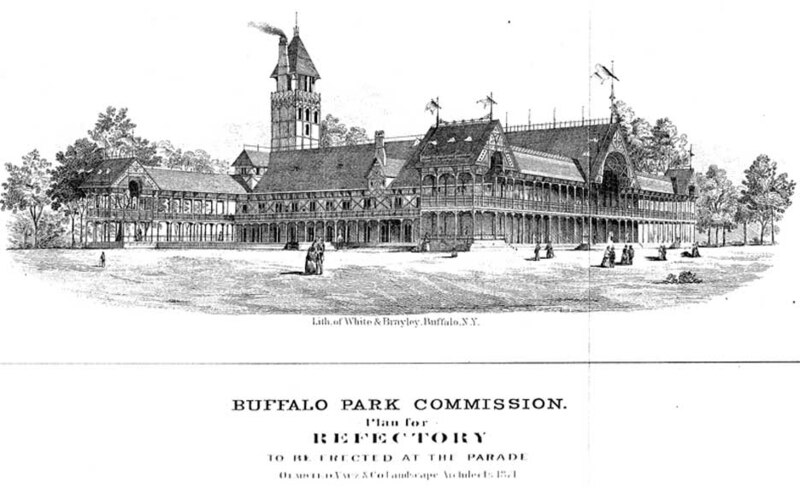 For the new Buffalo parks, Vaux designed a number of structures. Outstanding among them was the Parade House, a spectacular timber building that Vaux proposed in 1871. 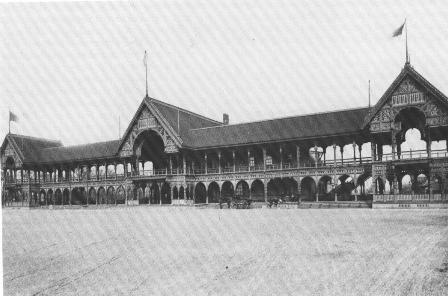 The building stood near the entrance to the Parade, where from the comfort of long verandas visitors could watch activities on the parade field. From the observation tower attached to the rear of the structure, they might also contemplate the city and Lake Erie. But most of all, the Parade House was the primary place within the Buffalo park system for festive socializing. Containing a large restaurant and smaller rooms for private parties, it became the scene in summer of public amusements that members of the large German community that lived nearby especially favored. On a special wooden floor set up outside, dancers twirled to the music of an orchestra seated overhead on a balcony while loungers on the extensive verandas enjoyed watching the gay proceeding. Instantly popular when it opened in 1876, the Parade House, noted a reporter for a local newspaper, became a place where "nightly congregates the young and tall and short and thick and thin, and a glance at many faces gathered there opens to view many sides of life." 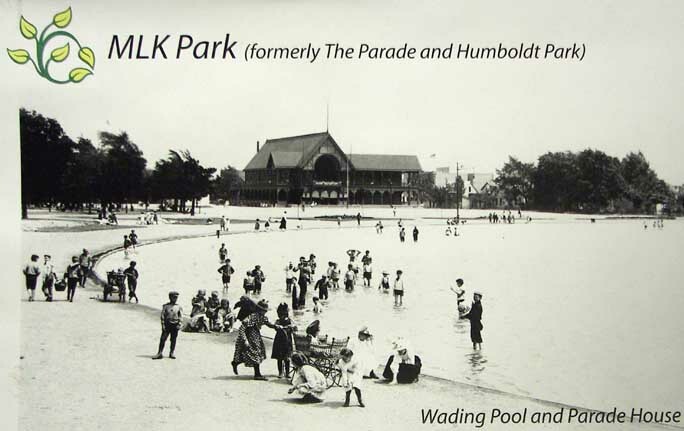 It fulfilled Olmsted and Vaux's intention that their parks foster the democratic spirit. The Parade House itself offered visitors a breathtaking display of turned, carved, and drilled wooden architecture. And as Thomas Wisedell prepared the working drawings and supervised construction, it may be that he was chiefly responsible for the building's ornate detailing. 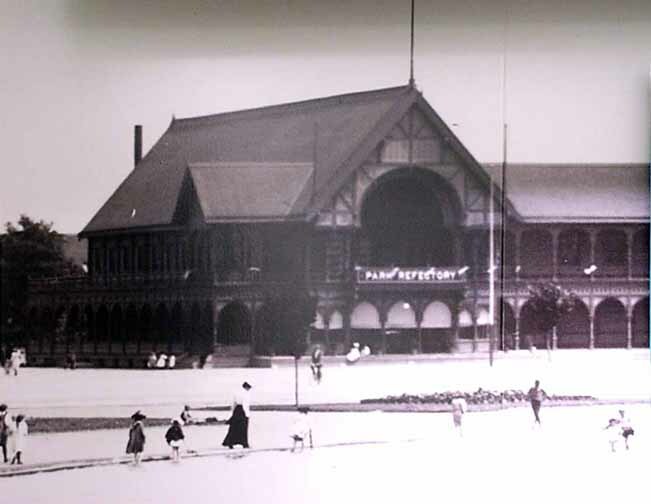 Painted in shades of red, green, and black, Buffalo's Parade House (which was demolished in the early twentieth century) ranked as one of the most lavish and fanciful park structures ever to grace an American municipal park. Special thanks to S. M. Broderick for editing corrections.